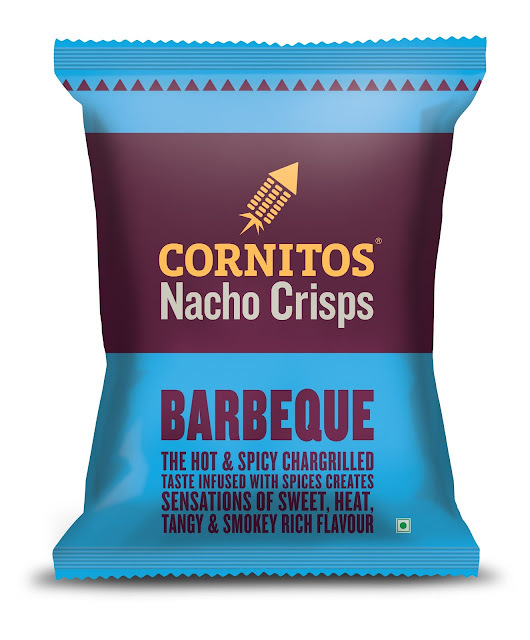 New Delhi, December 2016:- Cornitos ‘Barbeque’ flavor is perfect for winter parties, this flavor has a spicy tang infused with aromatic spices and seasoning. The Hot & Spicy chargrilled taste infused with spices creates sensations of sweet, heat, tangy & smoky rich flavor. The flavor compliments the season and keeps the snacking momentum on. Barbeque is one of the ten lip smacking flavors from the exotic range of Nacho crisps. Cornitos other flavors are Peri Peri, Sizzlin Jalapeno, Extra Cheesy - Cheese and Herbs, Tomato Mexicana, Tikka Masala, Sea Salt, Lime and Mint, Thai Sweet Chili and Wasabi. These thin crisps are ideal for parties and complement sandwiches, burgers, soups and more. Cornitos Nacho Crisps are made using special food grade NON-GMO yellow Corn procured through contract farming. Cornitos are made by the Mexican Lime-treatment process, of making traditional MASA using Stone Ground NON-GMO Corn. They are baked / cooked in corn oil to golden brown, making it crispier and healthier. A much needed alternative during this festive season when calorie intake tends to be very high. Cornitos aims to offers its patrons a range of nacho products that everyone can enjoy, irrespective of their age and also promote healthy eating along with tasty delights in the form of nachos. Greendot Health Foods Ltd was established in May 2009. It is the manufacturer of Cornitos Nachos Crisps. It was the first company to launch Tortilla Crisps in Indian branded snack food category. Recently the company has been awarded with the Best Food and Grocery Brand of the Year in Snack Category at the prestigious CMO Asia Excellence Awards held at Pan Pacific, Marina Square, Singapore. Cornitos Nachos is available across major modern retail outlets, multiplexes, movie theatres airlines and airports. GreenDot Health Foods Ltd. is a part of the well known ‘Globe Capacitors’ Group of Companies founded in 1978 by its Chairman Shri SP Agarwal and Mr. Sanjay Agarwal (MD). The parent company has carved a niche as one of the leading manufacturers in the Electronic Components Sector.